Combine the chocolate, coffee and milk, stirring to melt the chocolate. Add vanilla, egg yolks and beat using a wooden spoon until combined. Whisk the egg whites until soft peaks form. Sprinkle the castor sugar over and whisk until thick and glossy. Fold a large spoonful of the egg-white mixture into the chocolate mixture and then fold in the remaining egg-white mixture carefully. Fold in the beaten cream. Spoon into individual glasses. Cover with plastic wrap and refrigerate for at least 2 hours before serving. 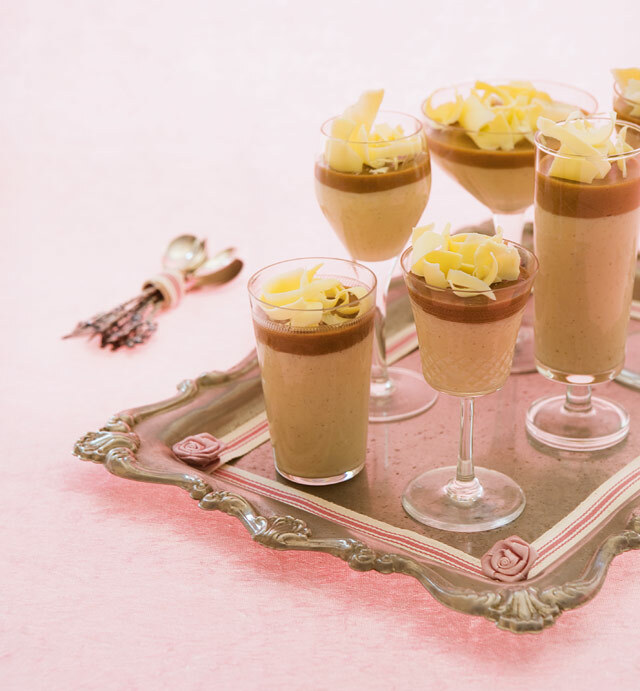 *To create the ‘latte’ effect, reserve ¼ of the mousse mixture. Sprinkle 1t gelatine over 30ml double espresso and heat to dissolve the gelatine. Whisk into the mousse and pour over the latte layer, once set. Alternatively, make another third of this recipe, replacing the white chocolate with dark chocolate.